Featured infographic courtesy of MAS. The Monetary Authority of Singapore (MAS) announced on June 27 2017 that it will streamline the regulatory requirements for banks seeking to conduct or invest in permissible non-financial businesses. These will be businesses that are related or complementary to banks’ core financial businesses. The regulatory framework separating banks’ financial and non-financial businesses (“anti-commingling framework”) was introduced in 2001 to ensure that banks remained focused on their core businesses and competencies. The banking landscape has evolved considerably since then. Technological advancements have created opportunities for banks to provide customers with integrated financial and related non-financial services through digital platforms. The proposed measures by MAS will give banks more flexibility to serve the needs of their customers while ensuring they remain focused on their core financial businesses. MAS will refine the anti-commingling framework for banks in two key aspects. First, MAS will make it easier for banks to conduct or invest in non-financial businesses that are related or complementary to their core financial businesses. (a) Banks need not seek prior regulatory approval before conducting or acquiring major equity stakes in permissible non-financial businesses. Banks will instead be required to notify MAS prior to doing so. MAS will continue to require banks to put in place appropriate risk management and governance arrangements to deal with the risks arising from these businesses. 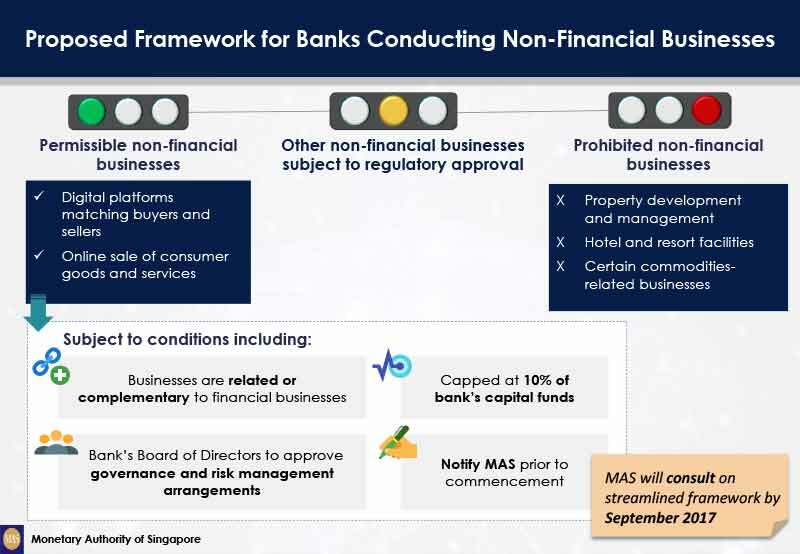 (b) To limit exposure and ensure that banks continue to focus on their core businesses, MAS will cap such permissible non-financial businesses to 10% of the bank’s capital funds. Second, MAS will allow banks to engage in the operation of digital platforms that match buyers and sellers of consumer goods or services as well as the online sale of such goods or services, if such activities are related or complementary to their core financial businesses. This recognises that online purchases of goods and services and the use of epayment services are becoming increasingly integrated. MAS’ proposed refinement will allow banks to broaden their ability to provide a fuller suite of services to their retail customers. Beyond digital platforms, banks will need to seek case-by-case approval, as they should not be engaging in the sale of consumer goods or services as a business in its own right. Notwithstanding the revision of the anti-commingling framework, banks will continue to be prohibited from entering certain businesses such as property development and the provision of hotel and resort facilities. MAS will consult on the operational details of these policy changes by end of September 2017.
b. prohibit banks from acquiring major stakes in a non-financial companies.